Take the pain out of weeding and planting! 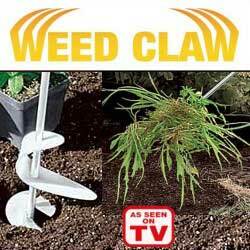 Simply attach the stainless steel Weed Claw or Bulb Drill to any standard electric drill. The Weed Claws revolutionary talon-grip head grabs weeds at their roots and spins then right out of the ground so the weeds are gone for good! The Bulb Drill digs perfect holes at the desired depth for tulips, hyacinths, daffodils and other bulbs.